Fallout 4 is a post-apocalyptic action role-playing video game developed by Bethesda Game Studios and published by Bethesda Softworks. It is the fifth major installment in the Fallout series and was released worldwide on November 10, 2015, for Microsoft Windows, PlayStation 4 and Xbox One. The game is set within an open world post-apocalyptic environment that encompasses the city of Boston and the surrounding Massachusetts region known as "The Commonwealth". The main story takes place in the year 2287, ten years after the events of Fallout 3 and 210 years after "The Great War", which caused catastrophic nuclear devastation across the United States. The player assumes control of a character referred to as the "Sole Survivor", who emerges from a long-term cryogenic stasis in Vault 111, an underground nuclear fallout shelter. After witnessing the murder of their spouse and kidnapping of their son, the Sole Survivor ventures out into the Commonwealth to search for their missing child. The player explores the game's dilapidated world, completes various quests, helps out factions, and acquires experience points to level up and increase the abilities of their character. New features to the series include the ability to develop and manage settlements and an extensive crafting system where materials scavenged from the environment can be used to craft drugs and explosives, upgrade weapons and armor, and construct, furnish and improve settlements. Fallout 4 also marks the first game in the series to feature full voice acting for the protagonist. Fallout 4 received positive reviews from critics with many praising the world depth, player freedom, overall amount of content, crafting, and soundtrack, while criticism was mainly directed at the game's visuals and technical issues. The game was a commercial and critical success, generating US$750 million within the first 24 hours of its launch, and received numerous accolades from various gaming publications and award events, including the respective awards for Game of the Year and Best Game at the Academy of Interactive Arts & Sciences and British Academy Games Awards. Bethesda has released six downloadable content add-ons, including the expansions Far Harbor and Nuka-World. Fallout 4 is an action role-playing game set in an open world environment, gameplay is similar to that of Fallout 3 and Fallout: New Vegas, the two previous primary iterations in the series. Returning features include a camera that can switch between a first-person and third-person perspective. Fallout 4 introduces features including a layered armor system, base-building, a dialogue system featuring 111,000 lines of dialogue, and a crafting system which implements every lootable object in the game. Enemies such as Mole Rats, Raiders, Super Mutants, Deathclaws, and Feral Ghouls return, along with the companion Dogmeat. The player has the ability to freely roam in the game's world and leave a conversation at any time. If the player has discovered a certain location they may fast travel to it. They have the ability to customize weapons; the game includes over 50 base guns, which can be crafted with a variety of modifications, such as barrel types and laser focus, with over 700 modifications available. Power Armor has been redesigned to be more like a vehicle than an equipable suit of armor, requiring energy cores and being essentially dead weight without it and can be modified, allowing the player to add items such as a jetpack or selecting separate types of armor for each part of the suit. A new feature to the series is the ability to craft and deconstruct settlements and buildings. The player can select many in-game objects and structures, and use them to freely build their own structures. In addition, the towns can be powered with working electricity, using a power line system. Merchants and non-player characters can inhabit the player's settlements, for which the player must provide sustenance by growing food in makeshift patches and building water pumps. The player can build various defenses around their settlements, such as turrets and traps, to defend against random attacks. The Pip-Boy, a personal computing device strapped to the player character's wrist, allows the player to access a menu with statistics, maps, data, and items the player has acquired. The player can find game cartridges, which can be played on the Pip-Boy or a terminal. A new feature for the Pip-Boy interface is a downloadable application for iOS, Android, and Windows smartphones and tablets. This optional app allows players to access the Pip-Boy interface on a separate screen, and play the collected game cartridges when not playing the main game. Another returning gameplay feature is the Vault-Tec Assisted Targeting System (V.A.T.S.). While using V.A.T.S., real-time combat is slowed down (instead of stopped entirely as in previous entries), and action is played out from varying camera angles in a computer graphics version of "bullet time". Various actions cost points, limiting the actions of each combatant during a period of time, and the player can target specific body parts for attacks to inflict specific injuries; headshots can be used for quick kills or to blind, legs can be targeted to slow enemy movement, and opponents can be disarmed by shooting at their weapons. Unlike previous games, in which the player had a random chance to inflict a critical hit, they are now performed manually through V.A.T.S. At the beginning of the game, players are given points to spend on a character progression system called S.P.E.C.I.A.L.. The system represents seven statistics, namely strength, perception, endurance, charisma, intelligence, agility, and luck. When the player earns enough experience points to gain a new level, they unlock an ability. When the player allocates more points to a statistic, more abilities can be unlocked. These perks can also be upgraded to improve the protagonist's efficiency and to further unlock abilities. There are about 275 perks available for the player to unlock. There is no level cap and the game does not end once the main story is complete. The player may travel with only one companion at a time, although other characters also accompany the player in certain quests. For the first time in the series, these companions can interact with the environment on the player character's behalf. For example, if the player character does not have required skills to hack a terminal or pick a lock, they can order the companion to do it for them. Any companion present besides Dogmeat will react to some of the player's actions in one of four ways (love, like, dislike, or hate), which either raises or lowers their "affinity". Raising a companion's affinity to 1,000 points will result in them "idolizing" the player and granting a specific perk. For example, Codsworth will provide bonus Energy Resistance. The companion will leave if affinity drops low enough, and some actions can even turn them hostile on sight. Fallout 4 takes place in the year 2287, ten years after the events of Fallout 3 and 210 years after the Great War, a war between the United States and China over natural resources that ended in a nuclear holocaust in 2077. The setting is a post-apocalyptic retro-future, covering a region that includes Boston and other parts of New England known as "The Commonwealth". Unlike the previous titles, Fallout 4's story begins on the day the bombs dropped: October 23, 2077. The game takes place in an alternate version of history that sees the 1940s and 1950s aesthetics such as diners and a drive-in theater. The design and technology advance in the directions imagined at the time. The resulting universe is thus a retro-futuristic one, where the technology has evolved enough to produce laser weapons, manipulate genes and create nearly-autonomous artificial intelligence, but all within the confines of 1950s solutions such as the widespread use of atomic power and vacuum tubes, as well as having the integrated circuitry of the digital age. The architecture, advertisements and general living styles are also depicted to be largely unchanged since the 1950s, while including contemporary products, such as a robotic rocking horse for children in one advertisement, or posters for the underground Vaults that play a central role in the storyline of the game. There are four main factions that the player can choose to support throughout the story; the Brotherhood of Steel, an anti-synth faction hoping to preserve technology in the Commonwealth; the Institute, a secretive organization that specializes in the creation of synths; the Minutemen; a faction that aims to drive out raiders and other threats to the Commonwealth; and the Railroad, a secretive organization dedicated to rescuing synths from the Institute. The player's character (voiced by either Brian T. Delaney or Courtenay Taylor) takes shelter in Vault 111, emerging exactly 210 years later on October 23, 2287, and assuming the name of the "Sole Survivor". There are thirteen possible companions in the story. Dogmeat, a loyal German Shepherd, is the only mandatory companion, but six others must at least be encountered; Codsworth (Stephen Russell), the Sole Survivor's robot butler; Deacon (Ryan Alosio), a Railroad agent; John Hancock (Danny Shorago), the mayor of Goodneighbor; Nick Valentine (Stephen Russell), a synth detective; Piper Wright (Courtney Ford), an intrepid reporter; and Preston Garvey (Jon Gentry), the reluctant leader of the Minutemen. The other six possible companions are Cait (Katy Townsend), an Irish-accented cage fighter; Curie (Sophie Simone Cortina), a robot scientist turned Synth; Danse (Peter Jessop), a Brotherhood of Steel Paladin; MacCready (Matthew Mercer), a mercenary; Strong (Sean Schemmel), a human-sympathetic Super Mutant; and X6-88 (David Paluck), an Institute Courser. Seven companions become romance options once they idolize the Sole Survivor: Cait, Curie, Danse, Hancock, MacCready, Piper, and Preston. The story begins in 2077 in Sanctuary Hills, located near Concord, Massachusetts. The player character is at home with their spouse (Nate or Nora depending on the player character's gender), their son Shaun, and Codsworth. A Vault-Tec representative admits the family into Vault 111, the local fallout shelter. Moments later, a news bulletin warns of an incoming nuclear attack. As the detonation occurs, the family evacuates to the Vault, where they are tricked into entering cryogenic tubes and frozen alive. After an unknown number of years, they are reawakened by two strangers, who murder the player's spouse and kidnap Shaun. The player is put back into cryogenic sleep but awakens again when the life support system malfunctions. The player, now known as the "Sole Survivor" of Vault 111, vows to avenge their spouse's death and find Shaun. The Sole Survivor heads home to find Sanctuary Hills in ruins. They reunite with Codsworth, revealing that 210 years have passed since the war. Codsworth suggests that the Survivor goes to Concord for help. The Survivor finds and befriends Dogmeat, and assists the Minutemen faction in evacuating to Sanctuary Hills. The Sole Survivor then travels to Diamond City, a fortified settlement based in the ruins of Fenway Park, where they meet Piper. There, they learn about a secretive organization called the Institute that has been terrifying the Commonwealth by kidnapping people and replacing them with "synths", synthetic humans indistinguishable from real humans. With the help of Nick Valentine, the Sole Survivor uncovers the identity of their spouse's killer: Conrad Kellogg (Keythe Farley). After learning from Kellogg that Shaun is being held in the Institute, the Sole Survivor kills him and retrieves a cybernetic implant from his brain to access his memories. During this time, the Brotherhood of Steel arrives in the Commonwealth on the Prydwen, an airship. The Sole Survivor learns from Brian Virgil (Matthew Waterson), an ex-Institute scientist, that teleportation is only way to enter the Institute. After the Survivor retrieves a chip and decodes it with the help of the Railroad, Virgil provides the blueprints for a teleportation device, which the Sole Survivor constructs by allying with the Brotherhood, Minutemen, or Railroad. The Sole Survivor successfully enters the Institute and discovers that Shaun is the Institute's director. Shaun, now an old man calling himself Father (Tony Amendola), reveals that he was kidnapped by Kellogg to become a specimen for synth experiments due to his pure pre-war DNA, and that the Sole Survivor remained in stasis for a further sixty years before being reawakened. He invites the Sole Survivor to join the Institute. If accepted, Shaun reveals that he is dying of cancer and wishes for the Survivor to become his successor. After initiating a purge in the Commonwealth, wiping out the Brotherhood and Railroad, the Survivor assumes control of the Institute after Shaun's death. Otherwise, the Sole Survivor devises a plan with their faction to fight the Institute. Siding with the Brotherhood or Railroad will force the Sole Survivor to destroy the other faction. The Sole Survivor detonates a nuclear reactor, destroying the Institute. After this feat, if the Survivor sided with the Minutemen, they must lastly wipe out any remaining hostile faction. Otherwise, they will remain neutral. The initial plans for Fallout 4 were formed in 2009, when director Todd Howard wanted to explore the world of Fallout before the bombs fell. Thus, a team began production on the game that year, including Istvan Pely, lead artist of Fallout 3, after finishing that game's downloadable content (DLC). Meanwhile, development on The Elder Scrolls V: Skyrim had Bethesda's full attention, and after that game released in 2011, the studio continued to regularly support it until 2013 with updates and DLC. After that content was finished, Fallout 4 entered full production from mid-2013 to mid-2015. Unlike the previous two titles—Fallout 3 and Fallout: New Vegas—which used the Gamebryo engine, Fallout 4 uses the Creation Engine, which was used in The Elder Scrolls V: Skyrim. Modified for Fallout 4, the Creation Engine includes a revamped character editor system that allows freeform creation of faces without the use of sliders seen in previous games. Instead, the player can click and drag each feature of the face to accurately customize their character, which can either be a man or woman as the previous Fallout titles have featured. Bethesda announced that the game would run at 1080p resolution and 30 frames per second on PlayStation 4 and Xbox One. Bethesda revealed that mobile devices would be integrated into the game as a form of second screen, acting as a secondary display for the Pip-Boy. Todd Howard revealed that mods for the PC versions of the game would be usable on the Xbox One version and that the team hoped to bring them to the PlayStation 4 version eventually. When asked about the failed effort to add a paid mod system to The Elder Scrolls V: Skyrim, Howard stated there were no plans for a similar effort with Fallout 4. The mods created by PC players through The Creation Kit, which contains the official modding tools, were released for Xbox One players and PlayStation 4 in May 2016 and June 2016 respectively. Fallout 4 mods were released to Xbox One in May 2016. PlayStation 4 mods were shot down by Sony in September 2016, but Bethesda announced a month later that mod support would still happen. As of November 2016, mod support for the PlayStation 4 version is present with the introduction of the 1.8 update. Fallout 4 uses Bethesda's Creation Engine, which was created for The Elder Scrolls V: Skyrim. Just after Fallout 3's release, the team devised numerous design objectives to meet for Skyrim—which were updated for Fallout 4's hardware requirements. The updated Creation Engine allows for graphical improvements over Bethesda's previous efforts. For instance, the draw distance renders much farther than in previous Fallout games. Dynamic lighting allows shadows to be created by any structure or item in the game world. Howard stated in the E3 Press Conference[when?] that the updated Creation Engine allows for next-generation god rays and advanced volumetric lighting. [vague] The engine features a variety of visual effects not present in previous Bethesda games such as motion blur, temporal anti-aliasing, height fog, dynamic dismemberment, screen space reflections, filmic tone mapping, an updated material system—for wet textures—among numerous others. The engine allows the Bethesda team to add more dynamic lighting to every scene as well as "paint surfaces with realistic materials". Bethesda released an example on how the engine works: "When a rain storm rolls in, our new material system allows the surfaces of the world to get wet, and a new cloth simulation system makes cloth, hair, and vegetation blow in the wind." The updated Creation Engine allows for a more advanced character creation system, which uses sculpting—forgoing the series of sliders present in previous games. In detail, the new character creation system introduces a new, freeform, slider-free facial editor controlled via dynamic, real-time modeling interface. With regards to the aforementioned fluid animations, the updated engine also allows a much more open approach to conversations with NPCs—wherein the camera views can change depending on the player's preference from a first-person view to a cinematic third-person view—compared to Fallout 3's rigid and instanced conversation system. The protagonist features dynamic dialogue, which is context sensitive and allows players to back out of a conversation. In Howard's words, "you are free to walk away anytime if you want, or you can even shoot him in the face." On June 2, 2015, Bethesda published a countdown timer scheduled to expire on June 3, 2015, at 14:00 UTC. The game's website went live slightly ahead of schedule, revealing the game along with its box art and platforms. The site was taken down later but was put back up again at the scheduled time. The trailer was released when the countdown timer expired, and the game was confirmed to take place in Boston and its surrounding Massachusetts countryside, as suggested by earlier rumors. More details were given during Bethesda's E3 2015 press conference on June 14, 2015. Fallout 4 became available for pre-order following the product announcement. In addition to the standard edition of the game, there is a collector's edition which includes a wearable replica of the Pip-Boy. This is able to house a smartphone device, which can run the second screen functionality of the game. As a pre-order bonus for the Windows version of the game, an announcer pack featuring the voice of Mister Handy was released for the multiplayer online battle arena game, Dota 2, developed by Valve Corporation. Bethesda announced that Fallout 4 had gone gold on October 23, 2015. The game was released for Windows, PlayStation 4 and Xbox One on November 10, 2015. After Fallout 4's release, Bethesda has released several patches to address some of the issues that were present at the game's launch along with presenting features that improve general gameplay. The first patch—coded as patch 1.2—fine-tuned the game by improving the frame rate. Patch 1.2 fixed a few bugs and errors present at the launch of the game but interfered with unofficial mod support. Patch 1.3 improved the game's graphics on all platforms, along with presenting the game with new features such as an added status menu for settlers in settlements. With regard to the graphical updates introduced in this patch, the PC platform was given a new weapon debris effect and a new ambient occlusion setting. The patch fixed several bugs and glitches present in the game. Patch 1.4 was designed to ready the game for the upcoming Creation Kit and downloadable content. Patch 1.4 brought a variety of additions to the settlement building mechanic of the game by adding a symbol to new content placed in by the modding community along with adding a variety of items, such as Raider and Super Mutant decors. The patch also brought general improvements to the game's stability. The 1.5 patch added a revamped survival mode along with support for the downloadable and included bug fixes. Similar to the previous Bethesda games, Fallout 4's fan community-created unofficial patches to address issues and bugs unaddressed by the official patches. During E3 2016, a virtual reality mode for the game was announced, to be released in 2017. Fallout 4 VR was released as a stand-alone game on December 4, 2017, for PC on the HTC Vive platform. On February 16, 2016, Bethesda announced details, prices, and release dates for the first three add-ons for Fallout 4. The first add-on, Automatron, which allows the player to build their custom robot companion by using robot parts while adding additional quests, was released to the European and North American markets on March 22, 2016. This was followed by Wasteland Workshop on April 12, 2016, which introduces new build options for settlements and the ability for the player to put captured creatures or humans in a cage, and adds new decorations like neon lights and lettering. The third add-on, titled Far Harbor, is a story expansion set in the post-war city of Far Harbor, Maine, and was released on May 19, 2016. On June 12, 2016, at E3 2016, Bethesda revealed three new add-on packages for the game; the first two, Contraptions Workshop, released on June 21, 2016, and Vault-Tec Workshop, released on July 26, 2016, are structured similarly to the Wasteland Workshop add-on, offering the player more build options and decorations; the Vault-Tec Workshop also adds a brief narrative. Fallout 4's third add-on, Nuka-World, which was released on August 30, 2016, adds an amusement park-based area for the player to explore, in which the player can either side with or put an end to various raider groups residing in the park. If the player decides to do the former, they can help one of the raider groups take control of various settlements in the Commonwealth from the base game. At E3 2017, Bethesda announced that Fallout 4 would support Creation Club, an in-game support system to purchase and download custom content. Creation Club went live in August 2017. Fallout 4 received "generally favorable" reviews on all three platforms according to review aggregator Metacritic. GameSpot's Peter Brown awarded it a score of 9 out of 10, saying "Fallout 4 is an argument for substance over style, and an excellent addition to the revered open-world series." Brown praised the "thought-provoking" narrative, "intuitive" creation tools, the large amount of content, the overall combat, and the overall freedom the player is given. Game Informer's Andrew Reiner scored the game a 9 out of 10 and said: "Bethesda has created another game you can lose your life in. New experiences just keep coming, and you always have another perk to unlock." Reiner praised the "vastly improved" combat, the "denser" world, and the "brilliant" score, but had mixed feelings about the visuals. 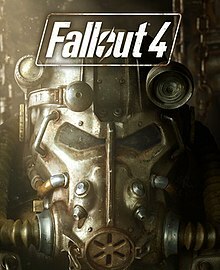 Dan Stapleton of IGN scored the game a 9.5 out of 10 and wrote: "The world, exploration, crafting, atmosphere, and story of Fallout 4 are all key parts of this hugely successful sandbox role-playing game. Great new reasons to obsessively gather and hoard relics of happier times, strong companions, and sympathetic villains driving tough decisions make it an adventure I'll definitely replay and revisit. Even the technical shakiness that crops up here and there can't even begin to slow down its momentum." Phil Savage of PC Gamer mentioned that Fallout 4 is "a loving production. It's filled with care and attention to detail" and that it was "a pleasure to pick through the world". He concluded his review stating "many of Fallout 4's problems, like every Bethesda RPG before it, are a consequence of what makes them unforgettable". Polygon awarded it a score of 9.5 out of 10, saying "Fallout 4 brings great gameplay to match its world and ambiance". Destructoid gave the game a 7.5 out of 10, writing "a lot of the franchise's signature problems have carried over directly into Fallout 4". Fallout 4 sold 1.2 million copies on Steam in its first 24 hours of release. The game also sold more digital than physical copies on day one of launch. With almost 470,000 concurrent Steam players on launch day, Fallout 4 broke Grand Theft Auto V's record for having the most concurrent online players in a Steam game not developed by Valve Corporation. Bethesda shipped 12 million units to retailers within the first 24 hours. In early 2017, Pete Hines announced that Fallout 4 had sold more copies over the same time period than Skyrim, though he did not provide an official number. ^ Hilliard, Kyle (September 5, 2015). "Bethesda Completes Recording Of Fallout 4's 111,000 Lines Of Dialogue". Game Informer. Retrieved October 19, 2015. ^ Chalk, Andy (June 17, 2015). "Fallout 4's Dogmeat cannot be killed". PC Gamer. Retrieved June 17, 2015. ^ a b Bethesda Softworks (June 15, 2015). Fallout 4 – E3 Showcase World Premiere (YouTube). Bethesda Softworks. Retrieved June 28, 2015. ^ Sykes, Tom (June 15, 2015). "Fallout 4 screenshots show jetpacks, mutants, more". PC Gamer. Retrieved June 15, 2015. ^ Hernandez, Patricia (June 14, 2015). "Fallout 4's Crafting System Looks Awesome". Kotaku. Retrieved June 15, 2015. ^ Ingenito, Vince (June 14, 2015). "E3 2015: Fallout 4's First Gameplay Details". IGN. Ziff Davis. Retrieved June 21, 2015. ^ McElroy, Griffin (July 24, 2015). "How Fallout 4 handles romance, character progression and more". Polygon. Retrieved July 25, 2015. ^ Chalk, Andy (August 6, 2015). "Fallout 4 will have no level cap and no hard finish". PC Gamer. Future Publishing. Retrieved August 8, 2015. ^ Stuart, Keith (June 15, 2015). "Fallout 4: release date and details, plus Dishonored 2". The Guardian. Retrieved June 15, 2015. ^ Hansen, Steven (July 24, 2015). "Fallout 4 has 12 companions, you can romance all the human ones". Destructoid. Retrieved July 25, 2015. ^ Ben Gilbert (December 3, 2015). "Inside the Fallout 4 development team". Business Insider. Retrieved November 16, 2018. ^ Houghton, David (June 15, 2015). "Fallout 4 kind of still uses the Oblivion engine, but do not fear 'Bethesda face'". GamesRadar. Retrieved June 15, 2015. ^ Hussain, Tamoor (June 22, 2015). "Fallout 4 Will Run 1080p/30fps on PS4, Xbox One, "PC Not Limited in Any Way"". GameSpot. CBS Interactive. Retrieved June 23, 2015. ^ Hall, Charlie (November 11, 2015). "Here's my Fallout 4 Pip-Boy, and it only cost $10". Polygon. Retrieved November 28, 2015. ^ Kato, Matthew (June 14, 2015). "Fallout 4 Gives Voice To Vault Survivor". Game Informer. Retrieved June 15, 2015. ^ Hillier, Brenna (June 23, 2015). "Meet the voices of Fallout 4′s not-silent protagonists". VG247. Retrieved June 23, 2015. ^ Velazco, Chris (June 15, 2015). "Your 'Fallout 4' PC mods will work fine on the Xbox One, too". Engadget. Retrieved June 15, 2015. ^ Jones, Gary (June 15, 2015). "Bethesda E3 announce 2015 release date and modding for Xbox One and PS4". Express.co.uk. Retrieved June 15, 2015. ^ Bogos, Steven (June 19, 2015). "No Plans For Fallout 4 Paid Mods, Says Bethesda". The Escapist. Retrieved June 19, 2015. ^ Yin-Poole, Wesley (April 27, 2016). "Fallout 4 mods come to Xbox One in May, PS4 in June". Eurogamer. Retrieved April 27, 2016. ^ "Fallout 4 and Skyrim are no longer getting mods on PS4". Retrieved February 14, 2018. ^ McWhertor, Michael (October 5, 2016). "Fallout 4 and Skyrim Special Edition will get mod support on PS4 after all". Polygon. Retrieved February 14, 2018. ^ "Bethesda.net". Bethesda.net. Retrieved February 14, 2018. ^ "Skyrim Performance Review: It's Definitely a DirectX 9 Game". PCWorld. Retrieved February 7, 2016. ^ "Bethesda Shows Off Fallout 4 Graphics – NVIDIA Volumetric Lighting Used – Legit Reviews". Legit Reviews. Retrieved February 7, 2016. ^ "Fallout 4: how Creation Engine enhancements make the game shine". VG247.com. Retrieved February 7, 2016. ^ "Bethesda.net". Bethesda.net. Retrieved February 7, 2016. ^ "Fallout 4 kind of still uses the Oblivion engine, but do not fear 'Bethesda face'". GamesRadar+. Retrieved February 7, 2016. ^ "Fallout 4 Features Dynamic Dialog And Dog Commands « GamingBolt.com: Video Game News, Reviews, Previews and Blog". gamingbolt.com. Retrieved February 7, 2016. ^ Karmali, Luke (June 2, 2015). "Fallout 4 Countdown Clock Appears, Runs Out Tomorrow". IGN. Retrieved June 3, 2015. ^ Hussain, Tamoor (June 3, 2015). "Fallout 4 Officially Confirmed for PC, Xbox One, PS4". GameSpot. Retrieved June 3, 2015. ^ Karmali, Luke (June 3, 2015). "Fallout 4 Officially Revealed With In-Game Trailer". IGN. Retrieved June 3, 2015. ^ Hernandez, Patricia (June 4, 2015). "All The Juicy Details Hidden In The Fallout 4 Trailer". Kotaku. Retrieved June 4, 2015. ^ Lee, Dave (June 3, 2015). "Fallout 4 confirmed for release by Bethesda – BBC News". BBC News. Retrieved June 3, 2015. ^ Karmali, Luke (February 10, 2015). "Bethesda Hosting its First Ever E3 Conference in 2015". IGN. Retrieved June 3, 2015. ^ Griffin, Andrew (June 3, 2015). "Fallout 4 announced: trailer and details revealed ahead of E3 launch". The Independent. Independent Print Limited. Retrieved June 3, 2015. ^ Miller, Ross (June 18, 2015). "Here's a first look at Fallout 4's Pip-Boy wearable". The Verge. Vox Media. Retrieved June 19, 2015. ^ Frank, Allegra. "Fallout 4 meets Dota 2 with Mister Handy announcer pack". Polygon. Retrieved June 27, 2016. ^ Osborn, Alex (October 23, 2015). "Fallout 4 Has Gone Gold – IGN". IGN. Retrieved November 2, 2015. ^ McWhertor, Michael (June 14, 2015). "Fallout 4 will be out Nov. 10, 2015". Polygon. Retrieved February 14, 2018. ^ "New Fallout 4 1.2 patch improves performance on all platforms — but at a cost | ExtremeTech". ExtremeTech. Retrieved March 1, 2016. ^ "'Fallout 4' Patch 1.2 Reportedly Breaks Mod Support: Here's How To Fix It". Tech Times. December 12, 2015. Retrieved March 1, 2016. ^ "Fallout 4 PC patch 1.3 out now". PC & Tech Authority. Retrieved March 1, 2016. ^ "Fallout 4: Patch 1.4 Brings A Number of Additions, Fixes and Performance Tweaks to The Game! | Day Herald". www.dayherald.com. Retrieved March 1, 2016. ^ "Fallout 4's New Update Arrives on PS4/Xbox One, Adding Survival Mode". GameSpot. Retrieved May 6, 2016. ^ Christopher Livingston (24 April 2016). "Fallout 4's unofficial patch nukes dozens of bugs". PC Gamer. Retrieved 2017-11-11. ^ Alex Walker (26 April 2016). "Fallout 4's Unofficial Patch Tries To Fix Everything Bethesda Can't". Kotaku. Retrieved 2017-11-11. ^ Chalk, Andy (2016-07-11). "Fallout 4 Unofficial Patch runs into a bug even it cannot fix". PC Gamer. Retrieved 2017-06-06. ^ "Virtual reality Fallout 4 is coming to HTC Vive in 2017". theverge. Retrieved June 14, 2016. ^ Sirani, Jordan (August 23, 2017). "Fallout 4 VR, Doom VFR, and Skyrim VR Release Dates Announced". IGN.com. Retrieved 2018-02-14. ^ "Fallout 4 Add-Ons – Automatron, Wasteland Workshop, Far Harbor and More". Bethesda Game Studios. February 16, 2016. Retrieved July 8, 2016. ^ Hernandez, Patricia. "Everything You Need To Know About Fallout 4's DLC, Which Starts In March". Kotaku. Retrieved February 16, 2016. ^ Makuch, Eddie (March 21, 2016). "Here's Exactly When Fallout 4 Automatron Expansion Unlocks". GameSpot. Retrieved March 28, 2016. ^ Livington, Christopher (April 23, 2016). "At $5, Fallout 4's Wasteland Workshop is barely worth it". PC Gamer. Retrieved April 23, 2016. ^ Hernandez, Patricia. "Fallout 4's Next DLC Drops April 12th, Lets You Collect Monsters Like Pokémon". Kotaku. Retrieved April 5, 2016. ^ Sarker, Samit (February 16, 2016). "Fallout 4 getting three add-ons this spring and more later, season pass price going up". Polygon. Retrieved February 17, 2016. ^ "Fallout 4's Massive Far Harbor Expansion Gets Release Date, New Trailer". ^ Thier, Dave. "The Real Bar Harbor Couldn't Be Happier About Fallout 4's 'Far Harbor'". forbes.com. Forbes. Retrieved May 26, 2016. ^ Krupa, Daniel (June 12, 2016). "E3 2016: New Fallout 4 DLC revealed". IGN. Ziff Davis. Retrieved June 13, 2016. ^ "Fallout 4 – Contraptions Workshop, Vault-Tec Workshop, and Nuka-World". Bethesda Game Studios. Bethesda Softworks. June 12, 2016. Retrieved June 20, 2016. ^ Rad, Chloi (June 11, 2017). "E3 2017: Bethesda Introduces Creation Club For Fallout 4 and Skyrim". Retrieved February 14, 2018. ^ McWhertor, Michael (August 28, 2017). "Fallout 4 Creation Club goes live, and yes there is horse armor". Polygon. Retrieved February 14, 2018. ^ Carter, Chris (November 9, 2015). "Review: Fallout 4". Destructoid. Retrieved November 9, 2015. ^ Buchholtz, Matt (November 9, 2015). "Fallout 4 review". Electronic Gaming Monthly. Retrieved November 9, 2015. ^ a b Reiner, Andrew (November 9, 2015). "A Familiar Wasteland – Fallout 4 – Xbox One". Game Informer. Retrieved November 9, 2015. ^ Tan, Nick (November 9, 2015). "Fallout 4 Review". Game Revolution. Retrieved November 9, 2015. ^ a b Brown, Peter (November 9, 2015). "Fallout 4 Review". GameSpot. Retrieved November 9, 2015. ^ Hurley, Leon (November 9, 2015). "Fallout 4 review". GamesRadar. Retrieved November 9, 2015. ^ Moore, Ben (November 9, 2015). "Fallout 4 Review". GameTrailers. Retrieved November 9, 2015. ^ Gerstmann, Jeff (November 10, 2015). "Fallout 4 (PC) Review". Giant Bomb. Retrieved November 10, 2015. ^ Gerstmann, Jeff (November 10, 2015). "Fallout 4 (PS4, XONE) Review". Giant Bomb. Retrieved November 10, 2015. ^ a b Stapleton, Dan (November 9, 2015). "Fallout 4 Review". IGN. Retrieved November 9, 2015. ^ a b Savage, Phil (November 9, 2015). "Fallout 4 review". PC Gamer. Retrieved November 9, 2015. ^ a b Gies, Arthur (November 9, 2015). "Fallout 4 review". Polygon. Retrieved November 9, 2015. ^ Miller, Simon (November 9, 2015). "Fallout 4 Review". VideoGamer.com. Retrieved November 9, 2015. ^ "Fallout 4 for PC Reviews". Metacritic. Archived from the original on March 3, 2018. Retrieved June 30, 2018. ^ "Fallout 4 for PlayStation 4 Reviews". Metacritic. Archived from the original on March 4, 2018. Retrieved June 30, 2018. ^ "Fallout 4 for Xbox One Reviews". Metacritic. Archived from the original on July 16, 2016. Retrieved July 1, 2016. ^ "Review: Fallout 4". Destructoid. ^ Davidson, Joey (November 11, 2015). "Fallout 4 sells 1.2 million copies on Steam during first day". Retrieved 2018-02-14. ^ Coone, Sharon (February 22, 2016). "Fallout 4 Sold More Digital Than Retail Copies Day One". Twinfinite. Retrieved February 23, 2016. ^ Nofuente, Kyle (November 11, 2015). "Fallout 4 Breaks Grand Theft Auto V Steam Concurrent User Records On Day One". Tech Times. ^ Makuch, Eddie. "Fallout 4 ships 12 million copies in one Day". GameSpot. GameSpot. Retrieved November 13, 2015. ^ Makuch, Eddie (2017-02-08). "Fallout 4 Surpasses Skyrim To Become Bethesda's Most Successful Game Ever". GameSpot. Retrieved 2018-06-03. ^ a b "The Best Games of 2015". GameSpot. Retrieved February 24, 2016. ^ Blain, Louise (December 25, 2015). "Reader voted GOTY 2015 – The Weekly Wrap Up". GamesRadar+. Retrieved February 7, 2016. ^ EGM staff (December 31, 2015). "EGM's Best of 2015: Part Five: #05 ~ #01". Electronic Gaming Monthly. EGM Media. Retrieved February 4, 2016. ^ Game Revolution staff (January 1, 2016). "Best of 2015 Awards". Game Revolution. Retrieved February 4, 2016. ^ "IGN's Best of 2015". IGN. Retrieved February 4, 2016. ^ "IGN's Gamescom People's Choice Award". IGN’s People’s Choice Award. Retrieved February 5, 2016. ^ "Telegraph Video Game Awards 2015". The Daily Telegraph. London: Telegraph Media Group. December 16, 2015. Retrieved February 4, 2016. ^ PC Gamer staff (December 24, 2015). "Best Setting 2015 — Fallout 4". PC Gamer. Retrieved February 4, 2016. ^ a b c "Game Critics Awards: Best of E3 2015 (2015 Winners)". Game Critics Awards. Retrieved February 15, 2018. ^ GamesRadar staff (December 31, 2015). "Game of the Year 2015". GamesRadar+. Retrieved February 24, 2016. ^ Hurley, Leon (October 30, 2015). "The Golden Joystick Awards: all the winners this year". GamesRadar+. Retrieved December 5, 2015. ^ Makuch, Eddie (January 13, 2016). "Rise of the Tomb Raider Leads D.I.C.E. Awards With 9 Nominations". GameSpot. Retrieved January 14, 2016. ^ "16th Annual Game Developers Choice Awards". Game Developers Choice Awards. Retrieved February 15, 2018. ^ Khan, Zarmena (March 20, 2016). "The Witcher 3 and Bloodborne Shine in SXSW 2016 Gaming Awards". PlayStation LifeStyle. Retrieved February 15, 2018. ^ "2015 Winners". National Academy of Video Game Trade Reviewers. March 21, 2016. Retrieved February 15, 2018. ^ Skrebels, Joe (March 10, 2016). "BAFTA Games Awards 2016 Nominees Revealed". IGN. Retrieved March 11, 2016. ^ "Game Critics Awards: Best of E3 2017 (2017 Nominees)". Game Critics Awards. Retrieved February 15, 2018. ^ "Super Mario Odyssey sweeps Best Of Gamescom awards". Metro. DMG Media. August 24, 2017. Retrieved February 15, 2018.